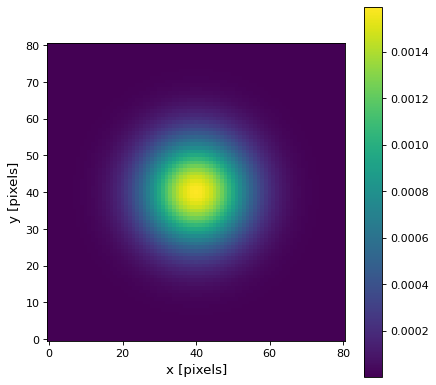 The Gaussian filter is a filter with great smoothing properties. It is isotropic and does not produce artifacts. Standard deviation of the Gaussian in x before rotating by theta. Standard deviation of the Gaussian in y before rotating by theta. Rotation angle in radians. The rotation angle increases counterclockwise. Size in x direction of the kernel array. Default = 8 * stddev. Size in y direction of the kernel array. Default = 8 * stddev.